The public have been invited to give their views on a £75m plan to convert a regional daily’s former home into offices and commerical space. 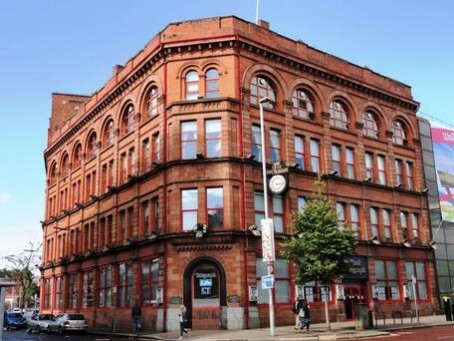 Plans have been announced to convert the Belfast Telegraph’s old Royal Avenue office, which the newspaper vacated in 2016 for a new base at Clarendon Dock. The redevopled Royal Avenue building is set to be named ‘The Sixth’, a title inspired by the Belfast Telegraph’s original evening edition. According to the Bel Tel, street vendors’ call of “Sixth Late Tele” was a familiar sound throughout Belfast for more than a century. The project, a joint venture between Belfast City Council and established property developer McAleer & Rushe, is expected to create around 650 jobs during construction and more than 2,000 jobs when fully occupied. The Grade B2-listed site, pictured, has been extended several times, now forming part of a complex of attached and interconnected buildings. Under the plans, non-listed parts of the site will be demolished and replaced with a “cohesive development sympathetically designed with regard to the surrounding built heritage and streetscape”. Since falling out of use as a newspaper office and print plant, Royal Avenue has been used as a music venue – hosting a series of concerts. German dance act Scooter are set to play there on Friday.